Scientists have long suspected that the way materials behave on the nanoscale – that is when particles have dimensions of about 1–100 nanometres – is different from how they behave on any other scale. A new paper in the journal Chemical Science provides concrete proof that this is the case. The laws of thermodynamics govern the behavior of materials in the macro world, while quantum mechanics describes behavior of particles at the other extreme, in the world of single atoms and electrons. But in the middle, on the order of around 10–100,000 molecules, something different is going on. Because it’s such a tiny scale, the particles have a really big surface-area-to-volume ratio. This means the energetics of what goes on at the surface become very important, much as they do on the atomic scale, where quantum mechanics is often applied. Classical thermodynamics breaks down. But because there are so many particles, and there are many interactions between them, the quantum model doesn’t quite work either. And because there are so many particles doing different things at the same time, it’s difficult to simulate all their interactions using a computer. It’s also hard to gather much experimental information, because we haven’t yet developed the capacity to measure behaviour on such a tiny scale. This conundrum becomes particularly acute when we’re trying to understand crystallisation, the process by which particles, randomly distributed in a solution, can form highly ordered crystal structures, given the right conditions. Chemists don’t really understand how this works. How do around 1018 molecules, moving around in solution at random, come together to form a micro- to millimetre size ordered crystal? Most remarkable perhaps is the fact that in most cases every crystal is ordered in the same way every time the crystal is formed. However, it turns out that different conditions can sometimes yield different crystal structures. These are known as polymorphs, and they’re important in many branches of science including medicine – a drug can behave differently in the body depending on which polymorph it’s crystallised in. What we do know so far about the process, at least according to one widely accepted model, is that particles in solution can come together to form a nucleus, and once a critical mass is reached we see crystal growth. The structure of the nucleus determines the structure of the final crystal, that is, which polymorph we get. What we have not known until now is what determines the structure of the nucleus in the first place, and that happens on the nanoscale. In this paper, the authors have used mechanochemistry – that is milling and grinding – to obtain nanosized particles, small enough that surface effects become significant. In other words, the chemistry of the nanoworld – which structures are the most stable at this scale, and what conditions affect their stability, has been studied for the first time with carefully controlled experiments. One of the key words of chemical synthesis is ‘control’. Chemists are always trying to control the properties of materials, whether that’s to make a better dye or plastic, or a drug that’s more effective in the body. So if we can learn to control how molecules in a solution come together to form solids, we can gain a great deal. This work is a significant first step in gaining that control. The batteries that power our high-tech lifestyle are built using materials extracted in dirty, often life-threatening conditions. If you have a cell phone, laptop, a hybrid car, or an electric vehicle, you may want to sit down. This may hurt. You have probably heard of blood diamonds and conflict minerals. Maybe you’ve even read up a bit on how big consumer tech companies are trying (and, in some cases, being forced by governments) to sort out where the materials that go into their gadgets come from. But stories about “supply chains,” “globalization,” and “poor working conditions” can seem a world away, or just plain academic. In a sweeping, heartbreaking series, the Washington Post is making sure it hits home. Take the example of Yu Yuan, a farmer who lives near a graphite factory in northeastern China. In a video, he swipes at shimmering grime accumulated in his window sill and points at a barren cornfield. The crops turn black with graphite dust he says, and don’t grow properly. He and his wife worry about the air they’re breathing and their water is undrinkable, polluted by chemicals dumped from the graphite plant. “There is nothing here once the factory is done damaging this place,” he says. Workers in Lubumbashi, Democratic Republic of the Congo, tend to an oven that processes slag from the region’s cobalt and copper-rich ores. Over two pieces so far, the Post has traced the path of first cobalt and then graphite as they make their way from mines to factories and ultimately into our hands as the cathodes and anodes, respectively, for lithium-ion batteries. Each story is a remarkable blend of globe-spanning investigative journalism, business reporting, and an appeal to us to confront the consequences of owning the devices that power our high-tech lifestyles. While graphite is mined and processed mostly in China, a huge amount of cobalt comes from mines in the Democratic Republic of the Congo, where “artisanal” miners sometimes dig through the floor of their own houses in search of ore. Mines collapse frequently. Injuries and death are commonplace. A “New Way” to Power Our World? (article continued) Lithium batteries are prized for being light and having a high energy density compared to other battery chemistries. The modern smartphone would be difficult to imagine without a lithium battery as its power supply. They help power hybrid cars, and the small but fast-growing fleet of all-electric vehicles wouldn’t exist without them. Interest in electric cars, in particular, is fueled by claims that the vehicles are clean and good for the environment. That may be true in the countries where they are mostly sold. But when we consider the bigger picture, the reality is something else altogether. Contact with Your Comments – We Love Hearing from You! Materials scientists have developed a new strategy for crafting one-dimensional nanorods from a wide range of precursor materials. Based on a cellulose backbone, the system relies on the growth of block copolymer “arms” that help create a compartment to serve as a nanometer-scale chemical reactor. The outer blocks of the arms prevent aggregation of the nanorods. The produced structures resemble tiny bottlebrushes with polymer “hairs” on the nanorod surface. The nanorods range in size from a few hundred nanometers to a few micrometers in length, and a few tens of nanometers in diameter. This new technique enables tight control over diameter, length and surface properties of the nanorods, whose optical, electrical, magnetic and catalytic properties depend on the precursor materials used and the dimensions of the nanorods. The nanorods could have applications in such areas as electronics, sensory devices, energy conversion and storage, drug delivery, and cancer treatment. Using their technique, the researchers have so far fabricated uniform metallic, ferroelectric, upconversion, semiconducting and thermoelectric nanocrystals, as well as combinations thereof. The research, supported by Air Force Office of Scientific Research, will be reported on September 16 in the journal Science. Nanorod structures aren’t new, but the technique used by Lin’s lab produces nanorods of uniform sizes – such as barium titanate and iron oxide, which have not yet been demonstrated via wet-chemistry approaches in the literature – and highly-uniform core-shell nanorods made by combining two dissimilar materials. Lin and former postdoctoral research associate Xinchang Pang say the precursor materials applicable to the technique are virtually limitless. Fabrication of the nanorods begins with the functionalization of individual lengths of cellulose, an inexpensive long-chain biopolymer harvested from trees. Each unit of cellulose has three hydroxyl groups, which are chemically modified with a bromine atom. The brominated cellulose then serves as macroinitiator for the growth of the block copolymer arms with well-controlled lengths using the atom transfer radical polymerization (ATRP) process, with, for example, poly(acrylic acid)-block-polystyrene (PAA-b-PS) yielding cellulose densely grafted with PAA-b-PS (i.e., cellulose-g-[PAA-b-PS]) that give the bottlebrush appearance. The next step involves the preferential partitioning of precursors in the inner PAA compartment that serves as a nanoreactor to initiate the nucleation and growth of nanorods. The densely grafted block copolymer arms, together with the rigid cellulose backbone, give researchers the ability to not only prevent aggregation of the resulting nanorods, but also to keep them from bending. By varying the chemistry and the number of blocks in the arms of the bottlebrush-like block copolymers, Lin and coworkers produced an array of oil-soluble and water-soluble plain nanorods, core-shell nanorods, and hollow nanorods – nanotubes – of different dimensions and compositions. For example, by using bottlebrush-like triblock copolymers containing densely grafted amphiphilic triblock copolymer arms, the core-shell nanorods can be formed from two different materials. In most cases, a large lattice mismatch between core and shell materials would prevent the formation of high-quality core-shell structures, but the technique overcomes that limitation. Lin sees many potential applications for the nanorods. For example, plain gold nanorods of different lengths may allow effective plasmonic absorption in the near-infrared range for use in solar energy conversion with improved harvesting of solar spectrum. The upconversion nanorods can preferentially harvest the IR solar photons, followed by the absorption of emitted high-energy photons to generate extra photocurrent in solar cells. They can also be used for biological labeling because of their low toxicity, chemical stability, and intense luminescence when excited by near-IR radiation, which can penetrate tissue much better than higher energy radiation such as ultraviolet, as is often required with quantum dot labels. The gold-iron oxide core-shell nanorods may be useful in cancer therapy, with MRI imaging enabled by the iron oxide shell, and local heating created by the photothermal effect on the gold nanorod core killing cancer cells. In addition to the researchers already mentioned, co-authors included graduate research assistant Yanjie He and postdoctoral researcher Jaehan Jung in Georgia Tech’s School of Materials Science and Engineering. This research was supported by the Air Force Office of Scientific Research under grant FA9550-16-1-0187. Any opinions, findings, and conclusions or recommendations expressed in this material are those of the authors and do not necessarily reflect the views of the sponsor. CITATION: Xinchang Pang, Yanjie He, Jaehan Jung, Zhiqun Lin, “1D nanocrystals with precisely controlled dimensions, compositions, and architectures,” (Science 2016). The secret to making the best energy storage materials is growing them with as much surface area as possible. Like baking, it requires just the right mixture of ingredients prepared in a specific amount and order at just the right temperature to produce a thin sheet of material with the perfect chemical consistency to be useful for storing energy. A team of researchers from Drexel University, Huazhong University of Science and Technology (HUST) and Tsinghua University recently discovered a way to improve the recipe and make the resulting materials bigger and better and soaking up energy—the secret? Just add salt. The team’s findings, which were recently published in the journal Nature Communications, show that using salt crystals as a template to grow thin sheets of conductive metal oxides make the materials turn out larger and more chemically pure—which makes them better suited for gathering ions and storing energy. 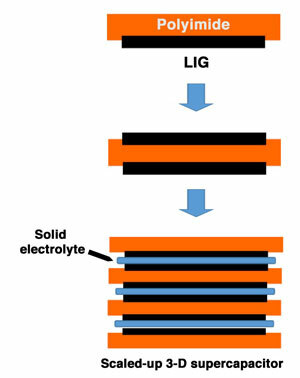 In an energy storage device—a battery or a capacitor, for example—energy is contained in the chemical transfer of ions from an electrolyte solution to thin layers of conductive materials. As these devices evolve they’re becoming smaller and capable of holding an electric charge for longer periods of time without needing a recharge. The reason for their improvement is that researchers are fabricating materials that are better equipped, structurally and chemically, for collecting and disbursing ions. In theory, the best materials for the job should be thin sheets of metal oxides, because their chemical structure and high surface area makes it easy for ions to attach—which is how energy storage occurs. But the metal oxide sheets that have been fabricated in labs thus far have fallen well short of their theoretical capabilities. According to Zhou, Tang and the team from HUST, the problem lies in the process of making the nanosheets—which involves either a deposition from gas or a chemical etching—often leaves trace chemical residues that contaminate the material and prevent ions from bonding to it. In addition, the materials made in this way are often just a few square micrometers in size. Using salt crystals as a substrate for growing the crystals lets them spread out and form a larger sheet of oxide material. Think of it like making a waffle by dripping batter into a pan versus pouring it into a big waffle iron; the key to getting a big, sturdy product is getting the solution—be it batter, or chemical compound—to spread evenly over the template and stabilize in a uniform way. The precursor solution coats the sides of the salt crystals as the oxides begin to form. After they’ve solidified, the salt is dissolved in a wash, leaving nanometer-thin two-dimensional sheets that formed on the sides of the salt crystal—and little trace of any contaminants that might hinder their energy storage performance. By making oxide nanosheets in this way, the only factors that limit their growth is the size of the salt crystal and the amount of precursor solution used. As predicted, the larger size of the oxide sheets also equated to a greater ability to collect and disburse ions from an electrolyte solution—the ultimate test for its potential to be used in energy storage devices. Results reported in the paper suggest that use of these materials may help in creating an aluminum-ion battery that could store more charge than the best lithium-ion batteries found in laptops and mobile devices today. Canada has a chance to add a new dimension to its energy economy – one that is clean, profitable and globally groundbreaking. The opportunity is electricity storage, which until now has been limited by technology to a relatively modest scale. That’s about to change. 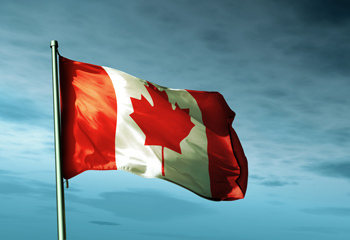 And it means that Canada – and specifically Ontario – can become an ideal seedbed for storage technology, because there are ready markets for both large- and small-scale storage systems. First, the large scale. Ontario has a fleet of nuclear generators that operate around the clock, and come close to filling the demand for power at off-peak hours. In addition, Ontario has developed a large renewable energy sector of wind and solar generation (in addition to its traditional hydro stations.) Problems sometimes arise when the natural weather cycles that drive wind and solar production are out of synch with the market cycle. On a sunny, breezy Saturday afternoon in May, with the nuclear plants running flat out, the hydro stations churning out power with the spring runoff and solar and wind systems near peak production, Ontario may have more electricity than it needs. Our electricity system operators have a solution, of course: Sell the excess electricity to our neighbours. But since our neighbours are often in the same boat, Ontario must cut the price close to zero – or in extreme situations, even pay neighbouring states or provinces to absorb our overproduction. Wouldn’t it make far more sense to store that excess energy, knowing that it will be needed in a matter of days, or even hours? What’s been lacking is the technology to do the job. That’s changing however, as Ontario’s current program to procure 50 megawatts of storage capacity demonstrates. Companies with a variety of approaches are working hard to bring their solutions to market – many of them clustered at the MaRS centre in Toronto. Some, such as Hydrogenics Corp., convert electricity into hydrogen, which can be used to supplement natural gas. My own company, NRStor, has partnered with Temporal Power and is operating a flywheel storage system in Minto, Ont., that helps the market operator to maintain consistent voltage on the grid. Of course, businesses around the globe are looking at the same opportunities as we are, and here lies the opportunity for Canada to rebrand its energy economy. A recent report by Deutsche Bank calls battery storage the “holy grail of solar penetration,” and believes that with the current rate of progress in improving efficiency, mass adoption of lithium ion batteries at a commercial/utility scale could occur before 2020. Analysis by Prof. Andrew Ford of Washington State University calculates that a 1,000-megawatt air storage system from U.S.-based General Compression Inc. could deliver $6- to $8-billion of value to Ontario – in the form of lower energy costs to local utilities – over a 20-year period. All this is of interest to large-scale electricity system operators, big utilities and their customers. But there is another reason for us to pay attention to energy storage – a reason grounded on a much more human scale. There are still large rural areas around the globe where there is no reliable electrical grid – including Northern Canada. There is great potential for these communities, including remote First Nations communities, to improve their standard of living by installing microscale renewable generation in combination with storage, and relying less on carbon-spewing diesel generators, powered by fuel that must be transported long distances at great expense. Storage is the key to making renewable energy a fully competitive component of any electrical grid. It can make our grid cleaner and more efficient, for the benefit of all consumers – large and small, urban and rural. We have the chance, in Canada, to become world leaders in developing this technology. Let’s seize it. Annette Verschuren is the chairwoman and CEO of NRStor and on the board of MaRS Discovery District. Annette Verschuren is speaking at the Cleantech Canadian Innovation Exchange (CIX Cleantech) conference in Toronto on Oct. 15. A discovery made in Leiden helps not only to make natural gas from CO2 but also to store renewable energy. Research by Professor Marc Koper and PhD student Jing Shen shows how this process can be implemented in a cost-effective and controllable way. 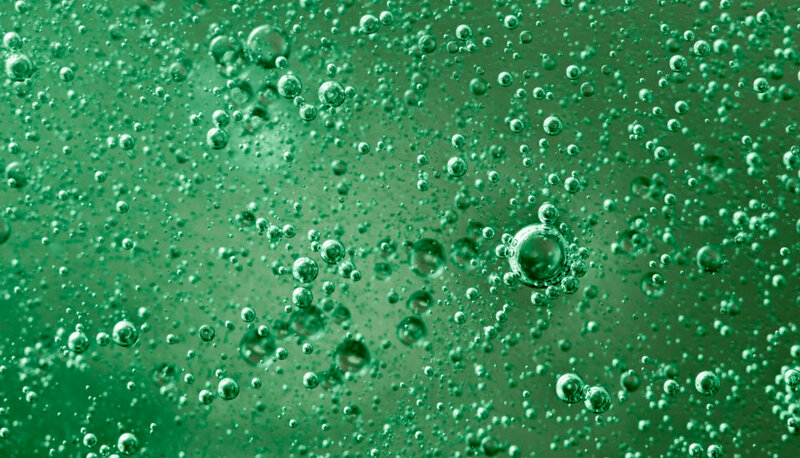 The conversion of the greenhouse gas CO2 into natural gas is achieved using a chemical process in which CO2 is bubbled through an acid solution. The solution contains a graphite electrode — to which a small negative voltage is applied — with a cobalt-porphyrin catalyst attached to it. It was already known that this catalyst can convert CO2 into carbon monoxide and methane, but the reaction always released unwanted hydrogen. In their investigation, Koper and Shen show for the first time how the process works. They therefore know exactly what the best acidity degree is in order to minimise the amount of hydrogen and to convert as much CO2 as possible into natural gas. An added benefit is that the catalyst is entirely made up of common materials. Cobalt porphyrin is a part of vitamin B12, while the graphite for the electrode is similar to a pencil lead. Therefore the catalyst only costs a few euros. Comparable methods of converting CO2 into methane often use rare and expensive metals, such as platinum. Koper hopes that this discovery will bring his dream a little closer to realisation: to convert CO2 and water, the by-products of fuels, into new energy or building blocks for the chemical industry. If this can be achieved using solar energy, this process will also offer a method of storing renewable energy. The above post is reprinted from materials provided by Leiden, Universiteit. Note: Materials may be edited for content and length. 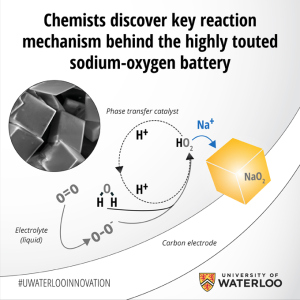 Chemists at the University of Waterloo have discovered the key reaction that takes place in sodium-air batteries that could pave the way for development of the so-called holy grail of electrochemical energy storage. 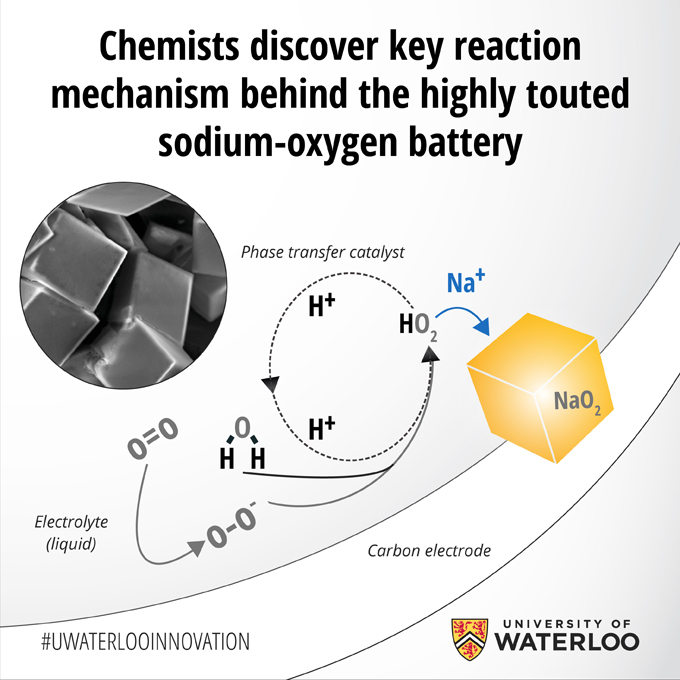 Researchers from the Waterloo Institute for Nanotechnology, led by Professor Linda Nazar who holds the Canada Research Chair in Solid State Energy Materials, have described a key mediation pathway that explains why sodium-oxygen batteries are more energy efficient compared with their lithium-oxygen counterparts. Oxygen is reduced at the surface of the cathode to form superoxide and reacts with trace water to form soluble HO2. The latter undergoes metathesis with Na+, driven by the free energy of formation of crystalline NaO2, to form cubic nuclei that crystallize from solution. Growth of the NaO2 from solution to form micrometre-sized cubes occurs via epitaxial growth promoted by phase-transfer catalysis of the superoxide from solution to the solid. Sodium-oxygen batteries are considered by many to be a particularly promising metal-oxygen battery combination. Although less energy dense than lithium–oxygen cells, they can be recharged with more than 93 per cent efficiency and are cheap enough for large-scale electrical grid storage. The key lies in Nazar’s group discovery of the so-called proton phase transfer catalyst. By isolating its role in the battery’s discharge and recharge reactions, Nazar and colleagues were not only able to boost the battery’s capacity, they achieved a near-perfect recharge of the cell. When the researchers eliminated the catalyst from the system, they found the battery no longer worked. In the case of the sodium–oxygen cell, the proton phase catalyst transfers the newly formed sodium superoxide (NaO2) entities to solution where they nucleate into well-defined nanocrystals to grow the discharge product as micron-sized cubes.The dimensions of the initially formed NaO2 are critical; theoretical calculations from a group at MIT has separately shown that NaO2 is energetically preferred over sodium peroxide, Na2O2 at the nanoscale.When the battery is recharged, these NaO2 cubes readily dissociate, with the reverse reaction facilitated once again by the proton phase catalyst. Chemistry says that the proton phase catalyst could work similarly with lithium-oxygen. However, the lithium superoxide (LiO2) entities are too unstable and convert immediately to lithium peroxide (Li2O2). Once Li2O2 forms, the catalyst cannot facilitate the reverse reaction, as the forward and reverse reactions are no longer the same.So, in order to achieve progress on lithium–oxygen systems, researchers need to find an additional redox mediator to charge the cell efficiently. ”We are investigating redox mediators as well as exploring new opportunities for sodium–oxygen batteries that this research has inspired,” said Nazar. “Lithium–oxygen and sodium-oxygen batteries have a very promising future, but their development must take into account the role of how high capacity – and reversibility – can be scientifically achieved.” Postdoctoral research associate Chun Xia along with doctoral students Robert Black, Russel Fernandes, and Brian Adams co-authored the paper. The ecoENERGY Innovation Initiative program of Natural Resources Canada, and the Natural Sciences and Engineering Research Council (NSERC) of Canada funded the project. 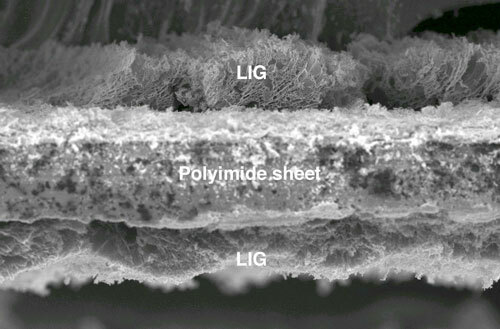 The research was reported this week in Applied Materials and Interfaces (“Flexible and Stackable Laser Induced Graphene Supercapacitors”).